NIWA’s spin-doctor, Network PR, likes to pretend that the NZT7 is really only a ‘revised’ version of Jim Salinger’s original 7SS. So when does a revision become a replacement? the NIWA Review Report (pdf, 7.5MB). The core of the 7SS was a series of adjustments of pre-1975 data at 7 locations, which lowered the older temperatures, thus creating an upward-sloping curve. The NZT7 now adopts the same core technique, with the same locations and achieves a comparable curve… but its adjustments are very, very different. We can start with the fact that the 7SS was constructed by a non-scientist student applying a DIY method at a time when there was no relevant scientific literature, and was never peer-reviewed. On the other hand, the NZT7 was devised by a team of six climate scientists, allegedly applying state-of-the-art 2010 statistical methods, which are said to be internally and externally peer-reviewed. The timespan of the 7SS was 150 years ending 2000, while the NZT7 covers 100 years ending 2009. The 7SS temperatures were calculated to a tenth of a degree, while the NZT7 uses two decimal places. The calculations for the 7SS have been mislaid, while those for the NZT7 are available and replicable. The 7SS adjustments had no error bars, while NIWA has promised that the error margins for the 11SS adjustments will be announced shortly. The pioneering methodology of the 7SS was never published, while that of the 11SS is to be the subject of a dedicated peer-reviewed article in a learned journal. The warming trends at six out of the seven stations are materially different between the 7SS and the NZT7. Four locations show higher trends while two are lower. Which are correct? As NIWA has now dropped the 7SS, it obviously believes those adjustments were wrong — or, at least, less defensible than the NZT7 figures. The methodologies have much in common. Both adjust all the historical records to be consistent with the current open site (but different ‘open’ sites are used). Both rely upon before-and-after comparisons with chosen reference stations to supply missing or suspect data. But here’s the rub… the NZT7 consistently rejects the reference stations used as comparators in the 7SS. But the really controversial elements in both series are the NIWA adjustments. A comparative Schedule of Adjustments highlights the numerous divergences between the offsets in each series. These pervasive differences illustrate just how subjective the adjustment decisions have been. • Of the 52 adjustments used in the 7SS, only one has been brought forward unchanged to the NZT7. • 16 of the pre-1913 7SS adjustments have now been discarded as “unreliable”. • In 14 cases, the period has been changed – either because the discontinuity date has been deemed wrong, or a different base station has been chosen. • In the 21 remaining cases, the temperature adjustment has changed. (Of these, 8 may owe something to the method change for decimal places). NIWA might fall back on the old story of the axe (seven new handles and three new heads, but it’s still my faithful old axe) to support their continuity claim. But to most interested observers, the NZT7 is not only a replacement for the 7SS, but a devastating critique of its many failures. NIWA is the defendant in Judicial Proceedings which seek a declaration that the 7SS is invalid, and an order that NIWA cease to use it as the official New Zealand Temperature Record. NIWA now (belatedly) shows every sign of being in full accord with these actions. Whereas it once forcefully declared that every 7SS adjustment was scientifically correct, it now seems equally set to prove that every such adjustment was either wrong or sub-optimal. The 7SS has been discarded… thrown under the proverbial bus… without ceremony or formal rites. It’s just gone. So, the 7SS is dead, but the NZT7 provides an almost identical result. A rose by any other name? Or in this case, a smelly fish by any other name…. Watch the pea under the shuffling thimbles. Bureaucrats are past masters at covering their butts by shifting thimbles. Or goalposts. Barry, you say “The calculations for the 7SS have been mislaid, while those for the NZT7 are available and replicable.” Could you provide a link to these data? On NIWA’s site they are still showing the ‘seven-station series‘ A search on their site of ‘NZT7’ yields no results. 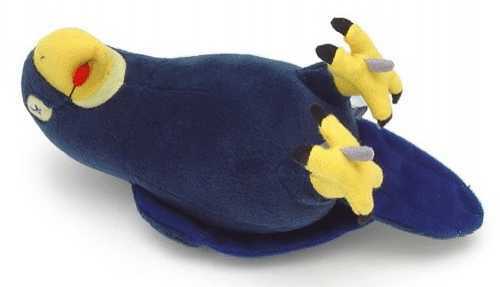 It would appear the parrot still squawks. The 0.91 C/century linear trend is bogus , meaningless, misleading and entirely selective. Obviously NIWA desperately want to convey the impression that by 2110, temperatures will be 0.9 C higher in conformance with IPCC global “projections” but why is the NZ trend totally out of sync with the SH trend? Conversely, using their trend, temperatures back in the early 1800s were 0.9 C cooler – I don’t think so. They are trying to tell us that NZ temperatures 1810-2110 will rise 2.7 C – have they no shame? Unless there is a reconstruction of temperatures back to say 1860, the linear trend is pure propagandist BS and scientifically unethical. Why the spurious claim? Why should I believe a publication of this group when the NIWA seem to strive for transparency? And if the results are similar, then who the hell cares anyway? The “seven-station series” now on the NIWA website is the new 1910-2010 NZT7 – comprising the Adjustments described in the Review Report of 17 December 2010. The 1853-2009 7SS, which has graced the website since last century, has disappeared. This is part of the spin that NZT7 is merely the “revised” version of the 7SS. Although over 97% of the Adjustments are different. The Old seven-station series is so yesterday that even its name has been taken over by the New seven-station series! Please explain why you make the strong claim that the first paragraph is ‘patently’ false. For the graph itself is NIWA’s ‘admission.’ It shows that New Zealand has experienced very little warming for the last 50 years. Almost all the warming took place from 1940 to 1960. Do you disagree with the graph? The second paragraph points out (rather simplistically, I thought at the time) that the rate of warming shown in the graph was nowhere near the global warming. The globe warmed about 0.6°C, according to NIWA, which was 33% less than NZ did at 0.91°C, so there’s a big disconnect between NZ and the world. Perhaps brought on by being in the middle of the Pacific Ocean. But what I said is true, so what do you disagree with? At that time, NIWA’s web site didn’t even mention that the raw data had been adjusted. Didn’t mention it! We noticed, and asked why they adjusted it. Believe this or not, as you please: they still have not answered us. Instead, they’ve produced an entirely new temperature series, costing them at least $70,000, explaining all the adjustments newly made, and, strangely, they have not explained why they replaced the old series, which they were staunchly defending just weeks ago. This affects everything. For example, in the first year (1910) the actual temperature in the 7SS spreadsheet is 12.52° while the NZT7 spreadsheet shows 12.47°. Yet, because different Normals are used in each case, the 1910 anomalies are shown as being identical. The two graphs are overlaid as if they share a common basis. Being derived from two different benchmarks, the graphs shouldn’t be compared. So does Salinger now have fresh grounds to appeal against unfair dismissal? I presume they replaced the old series as a result of the court action by the CSC. I suspect their reluctance to do so was in the knowledge that the results would probably be quite similar and a waste of money to revise. I could be wrong. The first paragraph I quoted is patently false. The NIWA have not been forced to admit or retract anything. They have produced results which are similar and their conclusions are the same. On their page is a blue subheading with the words “Our new analysis confirms the warming trend”. Am I missing something? I presume they replaced the old series as a result of the court action by the CSC. No, they didn’t. NIWA’s decision to replace the old series was taken before our application for judicial review. I suspect their reluctance to do so was in the knowledge that the results would probably be quite similar and a waste of money to revise. The correct question is: why did they decide to replace the old series at all? If there was nothing wrong with the series, it wouldn’t need replacing. It doesn’t matter. The only thing NIWA is guilty of is not having been unimpeachable from the start. Your claim that they have been forced to admit something is at best misleading. As you’ve already said, the original interpretation concluded the same thing. You imply that the new interpretation revealed something different. That is patently untrue, but your statement is cleverly worded enough that it remains valid. You sound like a politician. NIWA explain why warming has slowed down in NZ since 1960 in their explanation of the revisions. It coincides with a change in direction of the prevailing north-south winds over the island. “Although a linear trend has been fitted to the seven-station temperatures in Figure 2, we know that the variations in time are not completely uniform. For example, a markedly large warming occurred through the period 1940-1960. These higher frequency variations can be related to fluctuations in the prevailing north-south airflow across New Zealand. Figure 3 shows such a comparison, where the Northerly Flow Index is calculated from the Chatham Islands minus Hobart pressure difference (the reverse of the more commonly used Trenberth Southerly Index (Trenberth, 1976)). Again, there is very strong agreement between the seven-station temperatures and completely independent surface pressure measurements. Temperatures are higher in years with stronger northerly flow (more positive values of the Index), and lower in years with stronger southerly flow (more negative values of the Index). One would expect this, since southerly flow transports cool air from the Southern Oceans up over New Zealand. The representations you have made to the press have caused some outlets to report that scientists in New Zealand have admitted to faking temperature records and that new records show no warming. This is a charge of dishonesty and is itself untrue. Would you be willing to set the record straight? It doesn’t matter? So you think they spent $70,000 for no good reason? Of course it matters! Why did they reconstruct it, Matt? You say that NIWA is guilty of impeachable acts. I agree. But what acts? I did not imply, but stated outright, that the new graph demonstrates no significant warming after about 1960. NIWA agrees with this, giving the explanation that you educe in your quoted extract from the review, of altered air flow. But you also describe this as “patently false.” You present a contradiction. I made no allegation of faking records—those who did should set the record straight. I referred to little warming after 1960, and that is true. The evidence for that is in NIWA’s new graph. In a graphical sense, they “said” it. By the way, I’m looking forward to comments from our independent scientists, who can help we amateurs understand the science in NIWA’s review, including the statements you quote on wind flow. Until then, I’ve no idea whether they’re correct or even reasonable. Please remember that I’m not taking issue with NIWA over the conclusion of warming over the 100 years of the series. We (our scientists) have to examine the series. If they’re happy with NIWA’s work, we’ll go quiet, I promise. But they have swapped one set of adjustments for another without explanation or apology. That is wrong. No, I said they had not been unimpeachable. That means they were able to be successfully impeached (accused). What did you want from them? They gave you what you asked for. Now you are critical of that? You wanted an explanation. You got a re-evaluation that is peer reviewed and agrees. It was probably cheaper to do this than to continue to fight you in court. It seems they felt unable to satisfy enquiries about the validity of the earlier approach. I don’t know why and I don’t think it matters. You prompted them to re-analyze the data in a manner that could not be impeached. I don’t know whether that peace of mind is worth 70,000 dollars of taxpayer money but it is a consequence of your challenge. Where do you get your funding by the way? I don’t know whether the results are correct or reasonable either. All I know is that the results are the same. It seems to me that you knew what you were doing when you gave that press statement. At any rate, thank you for setting the record straight. There was no dishonesty and no retraction. Thank you. states that “there is no ‘official’ or formal New Zealand temperature record”. In para 8(b) it says the NZTR is not a public record for the purposes of the Public Records Act, using the exemption of “special collections” defined (in para 4(b)) as non-public records used for “research purposes”. In para 4, NIWA denies it has any obligation to use the best available data or best scientific techniques, while conceding that it has statutory duties to pursue excellence and to perform its functions efficiently and effectively. They took a line of defence that ultimately made it awkward to continue to hold onto the old series. A tactical error perhaps. Since Salinger’s original calculations had been lost they were forced to perform a new analysis. This is unfortunate, but ultimately to everyone’s benefit. Your organization has achieved a positive result and I think you should be proud of that, but you should limit your representations of success to reality. 1) NIWA tout the 0.91C/century obtained from the linear trend as being representative of NZs temperature when clearly an extrapolation of that trend back 100 years leads to an unrealistic prevailing climate as will extrapolating that trend 100 years into the future . 2) The trend is selectively obtained as the quote alludes because if data for say 50 years prior to the start of the 7SS is included, the 0.91 slope would be no longer valid. 3) If variations in time of NZ temperature are “not completely uniform” then why is a linear trend applied and not some other statistical best fit e,g. EMD. 4) The downward adjustments to the raw data are the origin of the trend so “unequivocal” 0.91C/century warming is purely an artifact of the adjustments. 5) The 0.91C/century trend is inconsistent with the longer-term SH trend, the reason for that is most likely as for 2) above. 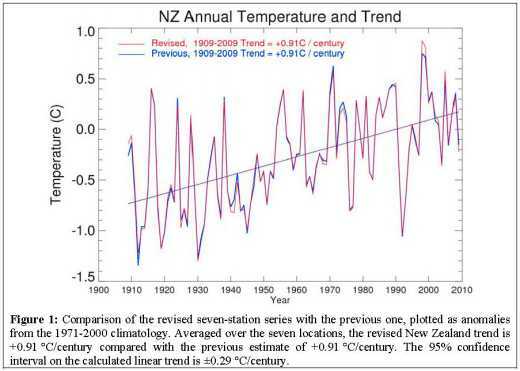 6) If the NZTR is detrended to account for the normal warming since 1850 as a result of solar variation and astronomical cycles and therefore internal climatological variation (for which there is ample scientific support), the trend since 1960 is decelerating rather than accelerating and could even be cooling, but application of a linear trend as the first and only statistical step will not reveal the inherent trend. Thank you. I apologise if I appeared to go beyond reality; it was unintentional. Perhaps the ego takes a while to forgive those who trample it; those slights to our scientists and cynically incorrect citations were deeply felt discourtesies which have not been followed by an apology. These were public scientists behaving badly. and you link to my press release of 11 Oct 2010. Tactical error or not, the series contained real errors and could not be justified because: 1) the (unpublished) methodology was too subjective; and 2) the actual workings had been lost, so the precise reasons for the adjustments could not be replicated in answer to our questions. However, NIWA did not admit that (which would have been the truthful, simple course) but chose to obscure it and work toward reconstructing the series. That’s annoying, coming from public servants! You may not be aware that the original graph has been used for many years as the official graph. NIWA cited it constantly on their web site, in environmental hearings, court cases and in advice to the government of the day. When they suddenly declared it “unofficial” to the High Court, it surprised everyone. It seemed to be a cynical manoeuvre to avoid taking responsibility for the graph’s deficiencies. Again, an unacceptable strategy from our public servants. 1. Does the data with adjustments for NZT7 get passed through a homogenising process or can one take the raw data, add in the adjustments and reproduce their graph. 2 has anyone analysed the validity of the NZT7 adjustments, if so, is that analysis available. The raw data are available in the NIWA CliFlo database. It’s free, but you have to register to get a login. The homogenising adjustments for their new NZT7 (as opposed to the old and now defunct 7SS) are documented on their website here. the spreadhseet containing just the adjusted data is here. There is some work going on in this area, but as we don’t have the sources of taxpayer funds available to NIWA, it’s slow going.